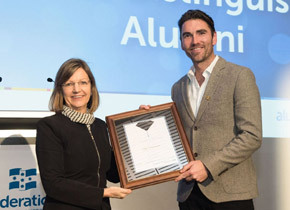 Seven prestigious Federation University Australia alumni members spanning more than a century have been honoured at a leading award ceremony in Ballarat. The 2018 Federation University Australia Alumni Awards event was held at the Caro Convention Centre, Mt Helen Campus on Monday, 23 July, with a number of prominent alumni, community members and stakeholders in attendance. “The University has a long history of producing outstanding alumni from all of our campuses,” Professor Helen Bartlett, Vice-Chancellor, said. “Our alumni community contributes to the communities in which they live and work in many different ways, including the professions, industry, the arts, sports and philanthropy. “Over 103,000 students have successfully graduated from the university since our foundation in the 1870s, including 25,000 alumni from 87 different countries around the world,” Professor Bartlett said. “This year’s seven award recipients are of an extremely high calibre. Tim Diamond is a passionate philanthropist who works closely with community and global influencers to drive conversation and action. Tim started the Unite Project to fight youth homelessness, founded the Run Australia events, initiated a campaign to raise funds and awareness of youth mental health with Beyond Blue, and has had a personal role in providing thousands of children overseas with access to education, facilities and resources through his work as General Manager of the Cotton On Foundation. Under his leadership, The Cotton On Foundation has become one of the most successful and unique philanthropic organisations globally. Their aim is to empower youth through quality education and deliver projects based on the UN’s Sustainable Development Goals. Tim heads their mission to establish 20,000 educational places globally by 2020. To date, they support over 11,000 children in schools across Southern Uganda, Thailand and South Africa and have raised over AU $70 million. In 2007, Tim formed a partnership with Mannya Village in Uganda, which lead to the official registration of the Cotton On Foundation as a charity organisation. In 2013, he met Ugandan President Museveni and his cabinet in Uganda. There, the President agreed to support ongoing efforts of the Ugandan Cotton on Foundation, a non-profit organisation. This was a major boost for the long-term sustainability of projects in remote areas of Uganda. Later that year, Tim spoke to over 60,000 attendees and 22 million viewers of the Global Citizen Festival in New York City. Rachel Flynn has made an impressive contribution to children’s literature as both an author and a teacher, and is one of Australia’s favourite authors for young people. She trained as a primary school teacher at Ballarat Teachers College, now part of FedUni, from 1971-1973 and began teaching children in 1974. While taking a break from teaching to bring up her own children, she became a writer of books for children and has since published numerous picture books and novels which have been translated into Dutch, French, Spanish, Korean and Chinese. She is best known for her I Hate Fridays series and her most widely read book, Sacked. Her most recently published book, Collecting Sunshine, was published earlier this year. Rachel is also an occasional poet with a list of occasional publications. Since 1995, she has taught in TAFE Professional Writing Programs around Melbourne. Rachel is currently doing a PhD in creative writing. Emily Ying has distinguished herself in the communications industry since completing her MBA with FedUni, working with top firms and not-for-profit government organisations across the globe. Her expertise centres in brand positioning, account servicing, integrated marketing, issues and crisis management, corporate and social responsibility and government relations. Emily Ying currently works for one of Forbes Asia’s Top 50 Companies, a leading integrated property developer in China, where she is responsible for supervising communication and branding activities for Malaysia, Indonesia, Australia and the UK. Prior to this, she was the general manager of Ruder Finn Thunder, one of the largest independent PR agencies in the world. In 2013, Emily established their Hong Kong and Guangzhou offices. Emily Ying is passionate about sharing her knowledge and experience with others and is a guest lecturer in Integrated Marketing Communications at Hong Kong University. She maintains a strong connection with Australia and contributes to China-Australia relations by volunteering with the Australia-China Alumni Association (ACAA) and the China Australia Chamber of Commerce-South China (AustCham). Margaret Heffernan has been an advocate, supporter, teacher, author and academic researcher in the area of gynaecological cancer for 30 years. Her interest in assisting cancer sufferers stems from her own experience with the disease and her desire to build on this life-changing experience to help others. In 2006, Margaret was awarded an Order of Australia Medal for her outstanding contributions to fighting the disease by raising millions of dollars to improve cancer wards, and by lobbying politicians and senior medical professionals. Margaret’s PhD research examining issues around HPV Vaccination in Indigenous and cross cultural communities assisted in the effective implementation of a human papillomavirus (HPV) vaccine, in particular into the Aboriginal and Chinese communities. She became a Founding Member of the International HPV Alliance and an advisor to Australian Healthcare Associates for the evaluation of the Connected Beginnings Project which aims to help Aboriginal and/or Torres Strait Islander children in areas of high need, be well prepared for school. Louis Buchner-Malcolm is believed to be the first School of Mines alumnus to complete a PhD, and the first to do so at an overseas university. He studied Mine Management and Geology at our SMB campus before going on to study anthropology, and received numerous scholarships including the 1851 Exhibition Scholarship. In 1914, World War I broke out while Louis was in Zurich undertaking research. He served as an officer in the Royal Garrison Artillery and saw action in France and West Africa, where he undertook research into the Eghap people of central Cameroon. He remained with the Artillery until 1919 obtaining the rank of Temporary Captain. He is listed on two WWI Honour Rolls in Ballarat. Louis published over 30 academic papers and held positions at a number of museums across his career including the Australian Museum, the Bristol Museum as Curator of Archaeology and Ethnology, and the Welcome Historical Medical Museum in London as Conservator and later Director. In 1937, he became Curator of the Homiman Museum in Forest Hill, London, a position he held until his death in 1946. Louis’ story is an important part of the history of Ballarat, both in terms of its academic history and its military history. Heather Pitman broke down barriers in engineering with an integrity that earned her tremendous respect in the sector and led to her becoming the first female Head of Engineering for the City of Ballarat. She studied at the School of Mines and Ballarat College of Advanced Education and was awarded the Civil Engineering Scholarship in 1977. Heather pioneered sustainable design and developed and approved Water Sensitive Urban Design (WSUD) projects, ranging from large scale wetlands projects to innovative water detention systems. She was the first of a new breed of engineers to consider the urban water cycle in its entirety and not in isolated parts, a radical approach at the time. In her honour, the Pitman Benjamin Engineering Prize was founded to recognise students like Heather, who have chosen not to accept the status quo, but instead to change the world to make it better for all. Heather died in 2005. Henry Sutton is considered one of Australia’s greatest inventors and innovators. He was at the forefront of some of the world’s greatest inventions – the telephone, the light globe, television and wireless telegraphy. At age 14, he became the first documented Australian to experiment with the principles of flight. Decades later he designed and built Australia’s first cars, and the world’s first documented front wheel drive vehicle. Henry first achieved world-wide acclaim for his invention of the storage battery, a device displayed at the 1882 Crystal Palace Electrical Exhibition in London, and praised by Thomas Edison as the greatest battery in the world. Henry’s multitude of other achievements include designing and building an ornithopter (helicopter) in 1870; being awarded a Silver medal for design and 30 other prizes at the Ballarat School of Design; designing and building a torpedo; writing two papers on artificial flight published in the Annual Report of the Aeronautical Society of Great Britain; designing and helping build Australia’s first hydraulic elevator lift; and co-founding the Royal Automobile Club of Victoria (RACV) in 1903. Henry Sutton died in 1912 but is still known and revered for his profound effect on modern day science, technology and engineering.